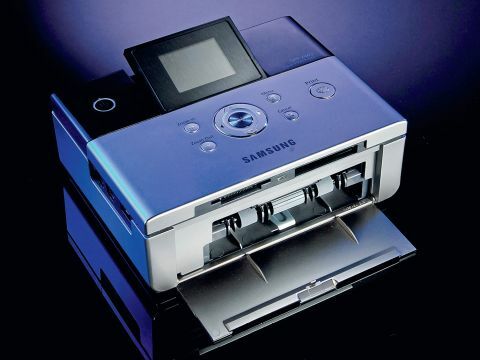 A newcomer into the photo printing sector, Samsung has recently launched two compact photo printers based on dye-sub technology, of which the SPP-2040 is the more up-market. With a considerably larger footprint than some competing models, especially when in use, the Samsung isn't much of a travelling companion either, as there's no optional battery pack that you can power it from. Back on the desk, the SPP-2040 does at least include a card reader and LCD screen, along with fairly basic standalone print controls. Print speeds are a little on the slow side for single photos but, if you print a number of shots in one batch, the speed increases noticeably after the first print. Of more permanent interest, print quality is pretty good all round, with a nice level of sharpness and fairly accurate colour rendition. In this respect, the Samsung came out ahead of the Canon dye-sub printers in our tests.